Beth & Cory's Mom: I'm Part of the U.S. Cellular Better Moments Blogger Brigade! I'm pretty excited about this. Last month I was contacted about participating in a new blogger ambassador program for U.S. Cellular. Being a current and long-time U.S. Cellular customer, I jumped at the chance. I'll be happy to tell you about my experiences with U.S. Cellular! We have, ever since we got cell phones, been U.S. Cellular customers. We've just never seen a reason to switch to anyone else. We've always had great coverage everywhere we go - except maybe when we visit my mom & dad - even when people with other providers had little to no signal. When they say that U.S. Cellular has the highest call quality of any national carrier, I believe it. They also have a a strong line-up of cutting-edge devices, so when it's time to upgrade phones there's no need to switch providers just to get the latest and greatest phones. Of course, I just started texting a couple years ago and never understood the importance of having the latest phone. But now that I've started using a smart phone and realizing all the things I can do with it, I am hooked! I am in a great position to tell you about the ways my U.S Cellular phone (and service) makes my life easier, because I'm just learning some of the cool things I can do. 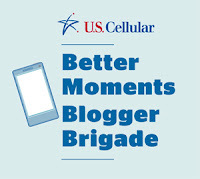 Being part of this U.S. Cellular Blogger Brigade means that I will be getting a new phone, and it will be one of the latest. I'm really looking forward to that because my husband took my last upgrade and passed his old phone to me. 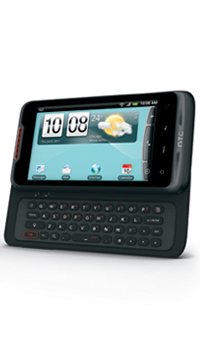 (HTC Merge, which is a nice phone; it's just old! - It is available for a penny right now if you want a brand new one.) I'm already realizing that there are things I could do faster and better with a new phone. Yes, this is going to be fun! I recently read that U.S. Cellular was named a J.D. Power and Associates Customer Service Champion in 2012 for the second year in a row, and in 2013 the company also received their 15th consecutive J.D. Power and Associates' award for "Highest Network Quality Performance Among Wireless Cell Phone Users In The North Central Region." I've never paid attention to awards and stuff like that, but we' have always been very happy with U.S. Cellular's customer service. We usually go to the same location, and they're always extremely friendly and helpful, whether we're looking at new phones, asking questions about the phones we already have, or looking for accessories like phone cases and chargers. They really do treat us like neighbors, not numbers. They take the time to talk to us and answer any questions we have and help us get the phones we want for the best prices. I remember one time we went in to get the kids new phones because the ones they wanted were on sale. When we got to the store we found out that because we were existing customers, the phones were even cheaper than advertised. That was the price new customers had to pay; current customers got a better price. I like a company that treats their current customers as well as or better than the new customers they are trying to get. When we do get new phones our friends at U.S. Cellular always make sure the phones are ready to use when we walk out the door. I didn't realize how special that was until my brother-in-law got a new smart phone recently - from another provider. Then he started calling Jeffrey asking all kinds of questions. It wasn't long before we realized that his provider had let him walk out of the store without helping him get the phone set up at all. He didn't even realize he needed a Google account to use his Android-powered phone. Seriously, this is his first smart phone. He could have used a little help! Disclosure: I will be compensated for my participation in this program as well as receiving a new phone. My experiences with and opinions of U.S. Cellular are 100% mine.